PROMT Professional 19is a business-level translator for professional, scientific, or educational activities. 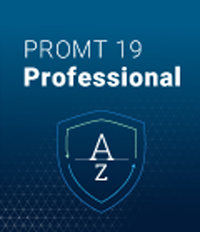 With PROMT Professional 19 you can quickly obtain high-quality translations of documents, Web sites, or emails. With this program you don't need to waste your time searching for a proper word in dictionaries, now it is possible to load the text entirely and to receive smooth translations as well as full information for separate words and phrases. Improved translation algorithms, updated dictionaries and unique PROMT translation technology, provide you with the best quality of machine translation from and into English. Letters, scientific articles, legal agreements, tables, presentations – all the documents you need for work, you can now read in the native language or instantly translate for your friends and colleagues. Modern PROMT technologies and our up-to-date dictionary bases guarantee high quality of translation. Translation with minimum effort in any Windows-run program or application. Translation of documents in Microsoft Office XP-2013 applications (Word, Excel, Outlook, PowerPoint), while preserving document formatting. Text translation containing specialized or industry lexicon and terminology. One word or a whole text, in the PROMT interface or in any program – translate with one click! Simply select a word or a text fragment, click a "hotkey", and the resulting translation will appear in a popup window of PROMT Agent. PROMT Agent will help you to quickly uptake on any website and view information in documents of any format instantly! Many formats including pdf, doc, docx, rtf, xls, xlsx, ppt, pptx, xml, msg, and html are all supported. User dictionaries: add your own translation of terms and designate your own "do not translate" rules for personalized translation. Use of translated text’s bases allows you to save time on common documents processing. Possible to translate several files at the same time while preserving the original structure and formatting. This saves a tremendous amount of time because you won't have to reformat tables, diagrams, or images. You get not only a simple translation, but also a ready-to-use document in the native language! Online translations from Arabic, Turkish, Chinese and Japanese are also included. The new version supports translation in OpenDocument Format (.odt, .ods). Online translations from Chinese, Arabic, Turkish, Japanese, Korean, Kazakh, Dutch, Hindi, Finnish and Hebrew - are also included.